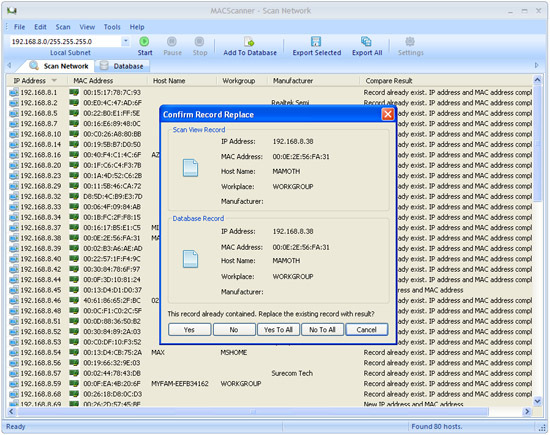 Trogon MAC Scanner is a useful software that provides network administrator with the abilty to scan MAC addresses and IP addresses of the defined subnet. This tool can save scan results to the database, automatic compare database records with a new scan results for detect illegal access to the network and export scan result to the file (XML, CSV, TXT). Trogon MAC Scanner scan local network and detect IP addresses and MAC addresses for every network devices. Also find additional attributes: host name, workgroup, network adapter manufacturer. Trogon MAC Scanner uses ARP protocol for scan subnet and uses multithreading for simultaneous a large number of queries send out. This allows scan network incredible fast. If your computer is connected with several subnets, you can select any for scan. 1. Trogon MAC Scanner scan local network, find all network devices, detect their IP addresses and MAC addresses and list these addresses in pairs. 2. Save scan results into the database - After scan is finished you can add scan results to the database. When results have been added to the database you can edit records. Qweas is providing links to Trogon MAC Scanner 2.4 as a courtesy, and makes no representations regarding Trogon MAC Scanner or any other applications or any information related thereto. Any questions, complaints or claims regarding this application Trogon MAC Scanner 2.4 must be directed to the appropriate software vendor. You may click the publisher link of Trogon MAC Scanner on the top of this page to get more details about the vendor.